Essentially a handheld version of the Master System, Sega's Game Gear was a powerful handheld with a colour screen that never really came close to competing with the Game Boy, wasn't as innovative as the Lynx, but still managed to get itself some fantastic games and has gracefully aged. 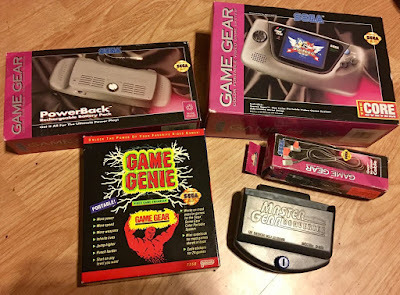 Happily, you can grab one along with some extremely handy accessories via this Sega Game Gear eBay auction. The console on offer is new in its box, as are the battery pack, the Game Genie, and the Gear-to-Gear cable. The Master Gear Converter that's part of the bundle is unboxed, but I suppose that's okay, as playing Master System cartridges on the go is still highly enjoyable.